The Schengen system of borderless travel across much of Europe faces many challenges, from the migration crisis to preventing crime and terrorism, writes Ester Herlin-Karnell. She argues that the system must be reformed to ensure that it is equipped to address these concerns, and that the reform process provides an opportunity for the UK in particular to engage and to increase its influence. 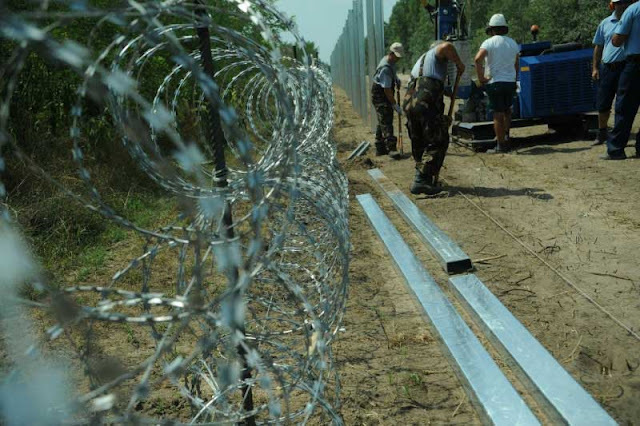 Image Attribute: Construction of barrier at the Hungarian-Serbian border. The Schengen Agreement of 1985 and the idea of open borders may be one of the hallmarks of European integration. However, in recent months the ideal of EU free movement has been put under extreme pressure as a result of the migration crisis and the need to fight terrorism and to monitor movement not only of those entering Europe, but also within the Union as such. The crisis of the EU has fuelled a different but related crisis in the UK political arena: the British referendum. Accordingly, in his recent letter to European Council President Donald Tusk outlining the UK’s options for staying in or leaving Europe, David Cameron gave an emphatic British ‘No’ to the one-size-fits-all approach of EU harmonisation. The UK government’s main difficulties with the EU seem centred on two particular aspects of integration: free movement rules in modern-day Europe and the apparent overreach of the EU courts in expanding integration – the latter of which it says must end. Yet the passport-free Schengen area has become one of the tenets of Europe itself, despite the fact that it does not include the UK and Ireland (which have opted out) and Bulgaria, Croatia, Cyprus and Romania (which are candidates for joining). The UK is of course not a party to the Schengen Agreement, but Cameron’s concerns neatly sum up what Schengen is about: free movement rights and no discrimination on the basis of nationality. The UK will no longer be part of an ‘ever closer’ Europe, nor will it support the EU’s current trajectory. An article in the Financial Times stated last month that: ‘If the Schengen accord finally buckles under the weight of Europe’s migration and security crises, the world’s biggest border-busting experiment will probably end as it began: with a long traffic jam.’ This appraisal might be too hasty in predicting Schengen’s downfall. What is really needed is a reform of the system to adequately address future challenges. In short, the Schengen acquis has been, in different respects, both a success story and a failure. It has been a vastly successful project in that it has helped to create a European identity. Once you are in the EU you are at home – the European fortress requires no border checks within its walls. At the same time, it has also been a failure in that not all EU Member States have opted to join in wholeheartedly. You can even go to non-EU members Switzerland, Norway and Iceland without a passport. Only the UK and Ireland maintain intra-EU border controls by choice (Protocol No 19 to the Lisbon Treaty), although they still use the Schengen Information System (SIS) for law enforcement purposes. Bulgaria, Croatia, Cyprus and Romania have all yet to be approved to join Schengen, when the current members agree that they meet the criteria. Moreover, Denmark is also in the Schengen area, despite its otherwise complicated relationship with the EU. On 3 December 2015, the Danes voted against the possibility of joining the policies associated with the EU’s Area of Freedom, Security and Justice. How they can be part of Schengen, but not part of EU criminal law and immigration cooperation, may seem a mystery for anyone outside the Kingdom of Denmark. In fact, Schengen is about more than just freedom from passports, queues and traffic jams. It has functioned as a means of regular exchange of information between Member States in order to counter terrorism, cross-border crime and illegal migration. The SIS is the most widely used information-sharing instrument today. Competent national authorities can use it to check alerts on wanted or missing persons and objects, both inside the Union and at the external border. The SIS was upgraded in early 2015 to improve information exchange on terrorist suspects and to reinforce the efforts of Member States to invalidate the travel documents of persons suspected of wanting to join terrorist groups outside the EU. The increased terror threat, coupled with the huge influx of migrants and refuges to Europe, has put the EU’s open border policy under strain and fuelled a new discussion on how it can be reformed. Member States such as Germany and Sweden, arguably the two most liberal countries in accepting refugees and migrants, have declared the need for exceptional measures and reinstated border controls. In circumstances such as these, is there any point to Schengen? The answer rests in what Schengen could offer the EU and its citizens in addition to ease of movement. To start, the EU already has many opportunities for cooperation which are not fully implemented or used. For example, the Prüm Treaty framework, another European information exchange tool, is not used to its full potential. The Prüm Treaty offers the possibility of automated comparison of DNA profiles, fingerprint data and vehicle registration data – all of which are key to providing evidence and detecting crime. Yet, as the European Commission noted in its European Agenda on Security, published earlier this year, the system is falling short of its potential because to date only a small number of Member States have implemented their legal obligations and integrated the network into their own systems. This is the price of flexibility – while nation state-friendly, it can sometimes result in half-baked solutions to pressing problems. This raises the prospect of whether free movement is an all or nothing endeavour. Perhaps it is when it comes to security. The challenges facing Schengen should be seen in the light of the merger of the migration acquis and the EU’s Security Agenda at large, along with the new challenges of terrorism. The point is that terrorism also encompasses online activity, not necessarily just physical movement across the EU. The Security Agenda sets tackling the risk of radicalisation as one of its main priorities, and that seems like a wise decision. But this requires more cooperation, not less. Free movement, money and criminals go hand in hand. Add to this the financial crisis and increased nationalistic sentiments across Europe, forces which were already putting pressure on Schengen. However, the idea of open borders is the idea of the internal market, and it is the first step to an Area of Freedom, Security and Justice. The real challenge will be to maintain the spirit of European cooperation and free movement within the internal market, integrated with a sophisticated intelligence system. One may also wonder if ‘smart’ borders (the EU’s goal for 2016) presupposes regular checks anyway? The Commission will present the Border Package before the end of the year. It aims to create a European border guard and to facilitate a more effective EU entry/exit system, allowing authorities to trace the movements of third country nationals across the EU’s external border. Yet in terms of the external dimension, perhaps too much trust is place in a European passport. In the regulation of asylum seekers, the EU Court of Justice has made it clear that in applying the Dublin System (which aims to ensure that one Member State is responsible for the examination of an asylum application, to prevent multiple asylum claims) a Member State cannot assume that an asylum seeker’s fundamental rights will be respected in another Member State. EU countries will have to ensure that they respect the fundamental rights of refugees. Yet this would require increased solidarity across Europe. The EU needs more advanced intelligence, which does not engage in general snooping of its citizens but can target criminal activity. But how can this be done? Fundamental rights protections and the rule of law should lead the EU in all its actions, and we cannot sacrifice these rights in a community based on equality, freedom and high human rights standards. Nevertheless, the intelligence methods used in order to identify those individuals who are exploiting the system need to be robust. The task for the EU legislator then is to maintain its high fundamental rights standards as set out in the Charter of Fundamental Rights, while securing fairness and freedom, security and justice for all. Such a system seems to presuppose an ever closer Union and that ‘closeness’ would require the UK, Ireland and the others to be on board. When times are tough, the EU usually comes up with big agreements creating new names and institutions. This is a real opportunity for the UK to take part in reforming Schengen, enhancing its engagement in Europe and regaining some of its influence. If it did, the new Schengen system might become known as the London Agreement. If not, it could well be named after Berlin. Prof Ester Herlin-Karnell is Professor of EU Constitutional Law and Justice and University Research Chair at VU University Amsterdam. She is Founder and Co-Director of the VU Centre for European Legal Studies. Her research interests include EU constitutional law and theory, European criminal law and the European Area of Freedom Security and Justice. This article is licensed under a Creative Commons (Attribution-NonCommercial-NoDerivatives 4.0 International) License by the original publisher – “European Futures” on December 15,2015. Please note that this article represents the view of the author(s) alone and not European Futures, the Edinburgh Europa Institute nor the University of Edinburgh.